Excellent place to relax, idyllic landscape by the Messinian sea shore, far away from city or surrounding noise. Close to beautiful sandy beaches and numerous villages. Friendly staff, very good service, cleaning every day, good breakfast and restaurant if someone prefers to stay in. Comfortable parking, spacious rooms and well equipped bathrooms. Location was great. The grounds were well kept. The evening lady was extremely nice. Location was excellent, 2 minute walk from beach and 25 minute walk/short bus ride into the town. Loved my room, breakfast was delicious, staff very friendly. Would stay here again. Really great location. Tasteful furnishings and lovely gardens. The staff were very accommodating for us poor vegetarians! The kitchen made us amazing burgers with no meat and they were delish! The beach bar staff were great and considering they have to run back and forth from the kitchen to get the food from across the road at the hotels kitchen they do a really great job. It is far enough out of town that it is quiet. Our room (19) was a great size travelling with 2 children. The air conditioning worked well. The town is close by and a taxi is only €5 euros one way. There are loads of bakeries, 2 large supermarkets and of course a variety of greek restaurants. Plenty for the seafood and meat lovers. The location is amazing. Right on the beach. There are 2 brothers who run the hotel & work each day. They give you so much individual attention. We had a free upgrade upon arrival to a larger room for 5 out of the 7 nights we booked as they had a free room. That was so welcome traveling with 2 almost teenage girls :) the decor in be property is beautiful. Very well thought out , old reclaimed furniture brought back to life :) One thing that stands out is the staff. There are 4-5 waitresses that work each day. They know your name , how how you take your coffee ; what type of wine you like. Now that is service!! On the last day the waitresses & 2 brothers all came to say goodbye & it was hugs & kisses all round. Really felt like we were leaving new friends. I will 100 % be back & encourage people to pay a visit. You will have an amazing holiday!! Everything was amazing during our stay in Golden Beach Hotel. 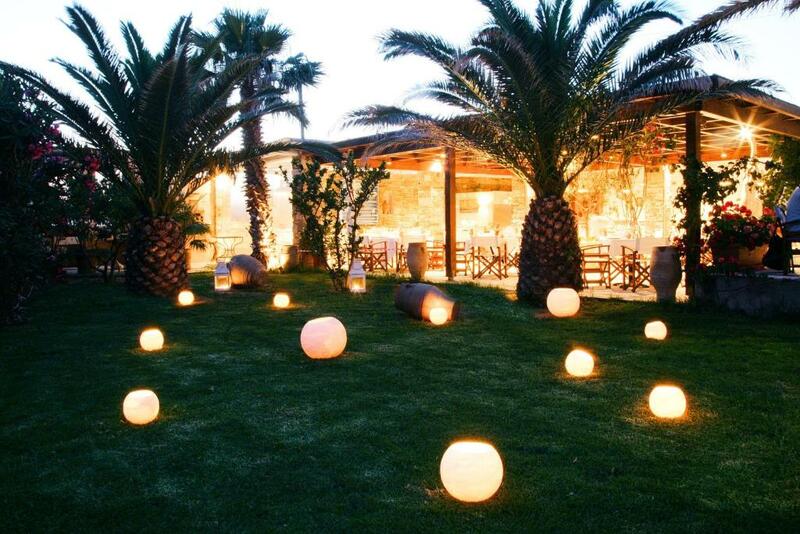 You are few steps away from the beautiful beach with amazing beach bar. The stuff at the beach are very nice and helpful. Amazing service! The rooms are designed very nice with amazingly cute taste. You have everything you need in the room. The owners of the hotel are so welcoming you feel like home. They helped us with evertything from recommending places to see and eat. The breakfast is amazing! The restaurant is breathtakingly amazing with the menu and the service! There is nothing i would say needs improvement. The owner took us with his own car on our way back to the ferry. I think this explains how amazing this hotel is.. We will definitely come again next year! Thank you so much again for such a nice hospitality. Exquisit location! Not too far from Tinos town, but away from traffic and noise. 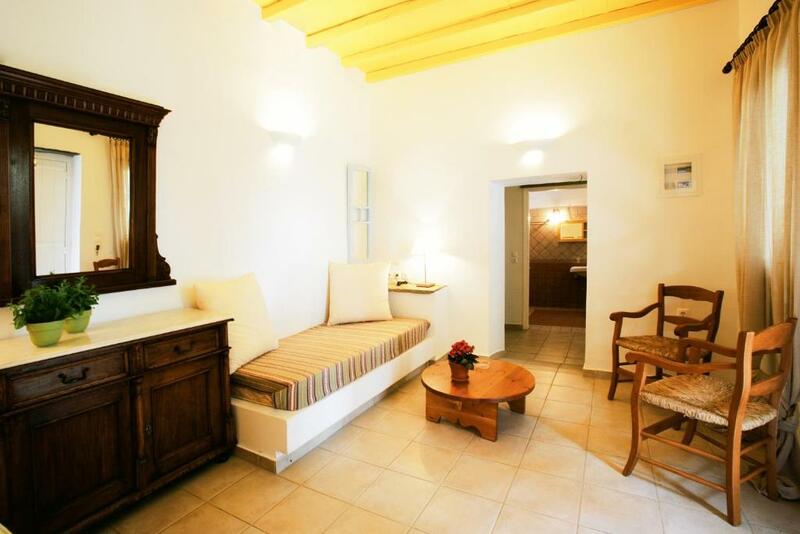 The hotel is traditionally decorated and its buildings give you the impression of a small village. Beautifully groomed gardens with mediterranean plants. 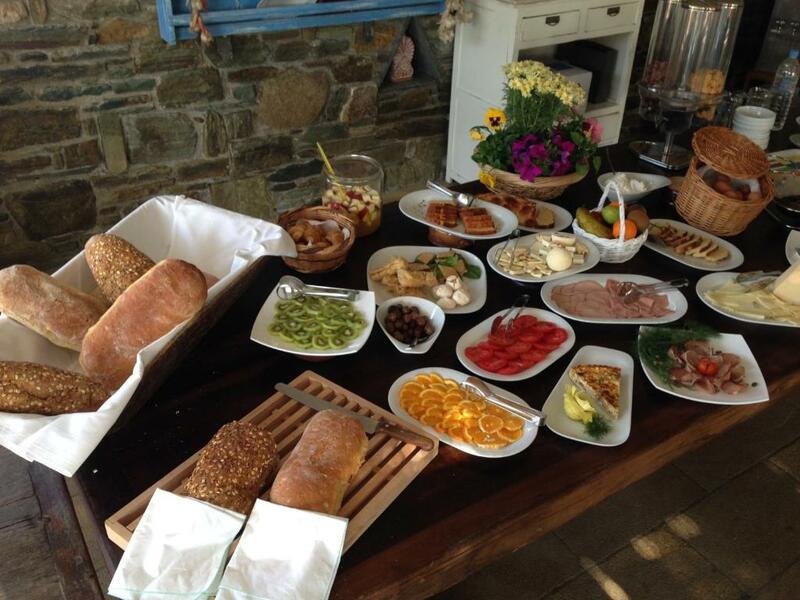 Bonus: exquisite, unpretentius cousine with fresh, local ingredients and traditional recipes. Golden Beach hotel and Apartments are something of a little hidden gem. Set amidst a beautiful bougainvillea setting and directly across the road from a stunning beach.The restaurant food is high class with local produce,make sure to try the artichoke frittata,it is amazing. The owners are very friendly,informative and so helpful with anything you may require. The staff working in the restaurant,beach bar and cleaning staff are handpicked and appear to enjoy their work with always a smile on their faces.My sister and I had an unforgettable holiday in Golden Beach and cannot recommend it highly enough. Lock in a great price for Golden Beach Hotel & Apartments – rated 8.9 by recent guests! 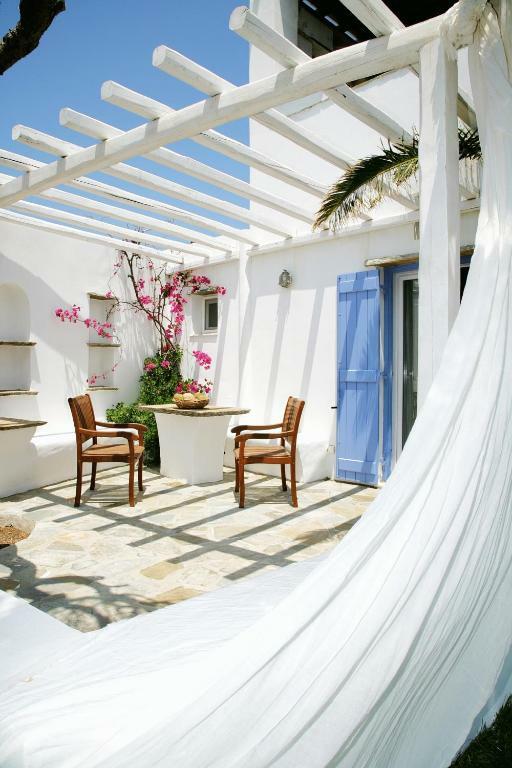 One of our top picks in Tinos.Golden Beach Hotel is set before a private sandy beach in Agios Fokas. 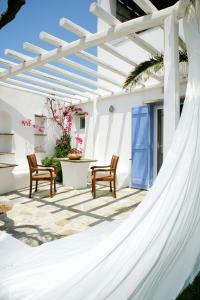 Accommodations resembles a Cycladic village surrounded by 15,000-m² of lush gardens. Tinos’ capital is just 1.2 mi away. 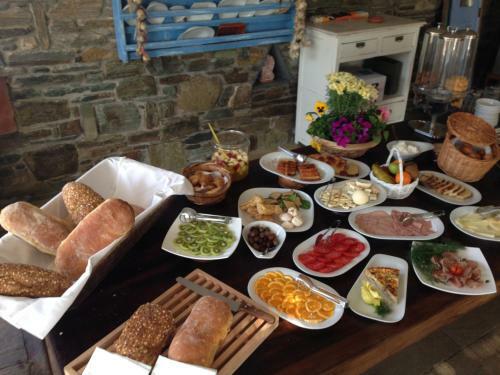 The rustic Cycladic-style rooms at the Golden Beach come with a kitchenette. 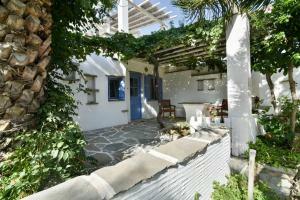 Each has a paved veranda with bench and wooden furnishings overlooking the sea or the gardens. Waiter service and free sun beds and umbrellas are available on the beach. Children enjoy a playground area. Transfer from and to the port can be provided on request and at extra charge. Guests can start their day with a Continental breakfast. Pergola Café serves tasty Mediterranean cuisine, while fresh juices and cocktails are available at the Lounge Bar. 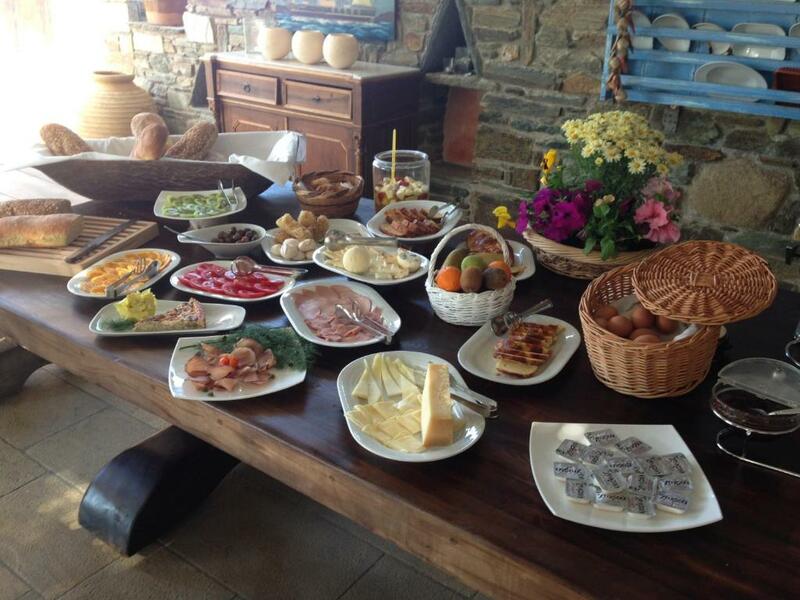 Asteria Restaurant proposes traditional dishes made with organic products. The helpful staff can arrange car rental service. The Golden Beach Hotel has a spacious parking area, and free Wi-Fi is available in public hotel areas. When would you like to stay at Golden Beach Hotel & Apartments? Spacious open-plan studio with kitchenette. Each studio has a veranda overlooking the gardens or with sea view. Features a separate sitting room with sleeping area for 2, kitchenette and a large porch with sea or grounds views. Features a large living room with sleeping area for 2, one bedroom, 2 bathrooms, kitchenette and a large porch with sea or grounds views. Spacious studio with open-plan bedroom and living room, kitchenette and a porch overlooking the grounds or with a sea view. House Rules Golden Beach Hotel & Apartments takes special requests – add in the next step! Golden Beach Hotel &amp; Apartments accepts these cards and reserves the right to temporarily hold an amount prior to arrival. Golden Beach Hotel & Apartments accepts these cards and reserves the right to temporarily hold an amount prior to arrival. The hotel is is need of some handy man attention in the rooms. Doors don't close properly - just need to take off the hinges and sand a little off the bottom or top. The kitchen cupboards do not close properly and my poor husband got hit 3 times in his cheek as it swung open! There is no chance to really cook in your room as 1) no extraction fan to remove smells 2) the are not any kitchen utensils like a spatula, wooden spoon, tongs, peeler. Yes you have glasses, plates and pots and a fry pan but only cutlery - you need utensils. Also I would recommend that the hotel has a couple if bicycles to ride up to the supermarket or offer to have some items on arrival. We had no car and were hoping that there would be a mini mart close by. It is infact a good 17minute walk and even though this might not seem far, when you have to carry back water and beer it is a long way! You cannot drink the tap water, not even brush your teeth with it!! Wi-fi is not available in the rooms and is not strong enough in the rest of the hotel places. The 2nd bed in our 4-bed room was smaller than normal. 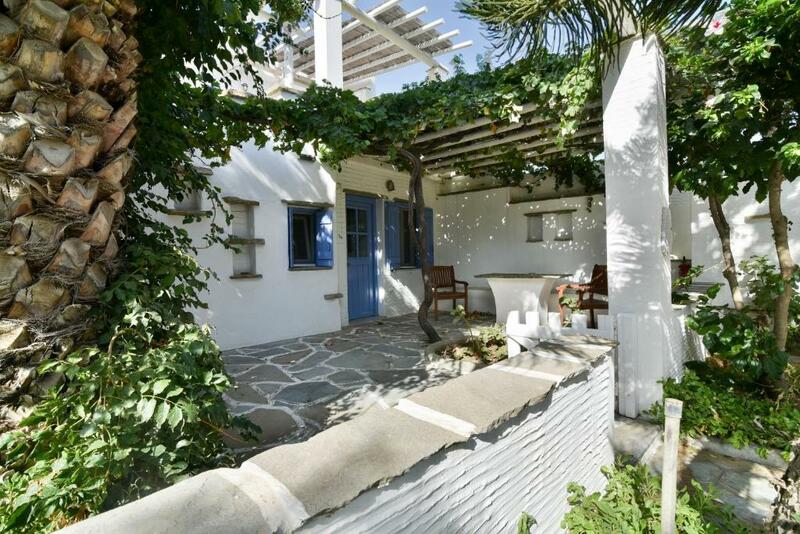 Absolutely fabulous, friendly helpful owner, great value for money and so spacious, great location close to beach and walking distance to Tinos town and port. Locals are all friendly and welcoming. Hire a car to see the rest of the island. The resort is a €5 taxi from the port and town which takes about five minutes. It could be walked if you were so inclined! The resort is nestled in beautiful gardens and trees and you feel like you have your own space. The rooms are spacious and the bathrooms were lovely. We paid €8 for a continental breakfast with local cheeses and fruit as well as good coffee. The beach is right in front of you with loungers free to use. Lots of restaurants to choose from in town. We only stayed two days but were recommended by many locals to explore the island more, so stay a few days longer! The breakfast staff was real rude especially the one who drove a smart car. She keep giving us dirty looks and wouldn't talk to us. She was over accommodating to the Germans. Breakfast selection was slim. Location is great , just less than 10 mins taxi ride from the port and main town , very clean and nice beach . 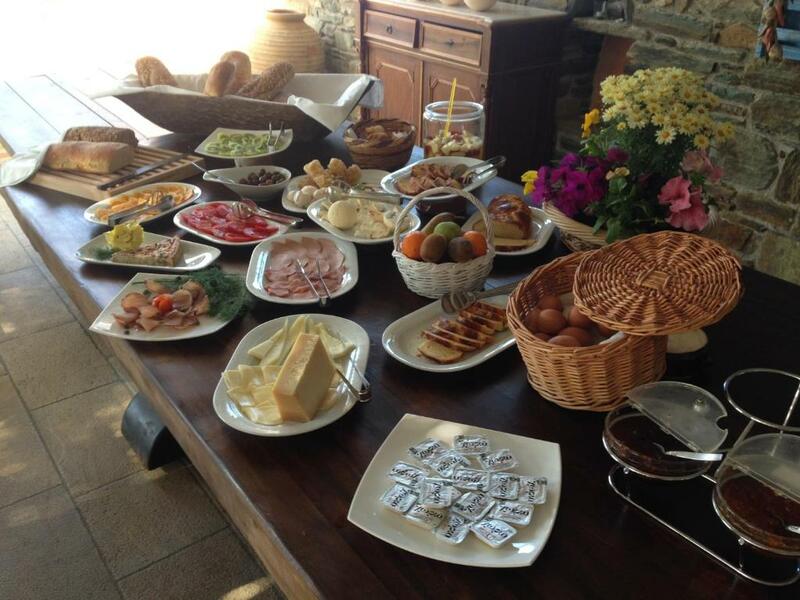 Breakfast buffet could be more rich, replenished more often and perhaps it could last longer.